August 30, 2016 – Bouchard Cleaning & Restoration DKI, a member company of DKI, North America’s largest disaster restoration contracting organization, just celebrated its one-year anniversary for Fire Forward during its 3rd Annual Customer Appreciation Day on Friday, August 26, 2016 at its facility at 94 Banair Rd. in Bangor, Maine. 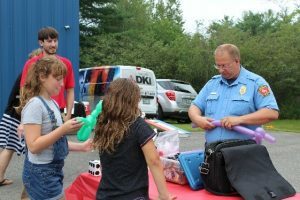 The event ran from 11:00 a.m. to 2:00 p.m. to celebrate all of Bouchard Cleaning & Restoration’s customers and community with food, refreshments, fun and games, including a chance for the local children to get up close and personal with a live fire truck and meet an actual firefighter from the Bangor Fire Department. There was also a live broadcast with Stephen King’s radio station, WKIT. During the event, the team hosted a bone marrow registry, a blood drive to support the local American Red Cross, and continued to collect donations for the one-year anniversary of its Fire Forward Program. The Fire Forward Program, founded by Director of Marketing Lara Clark, helps children of families who have suffered from fire damage to their homes. Helping the children helps provide relief and support to the entire family. Through the program, Bouchard Cleaning & Restoration collects new and gently used toys, clothing, toiletries, etc. from local businesses and insurance agencies. “This (program) has been a great way to help those in our community to begin their road to recovery after such devastation. This will be a continually growing initiative for us, and we hope to expand this program to help out veterans and battered women as well,” said Clark. If you are interested in donating to the Fire Forward Program, please send new or gently used toys, blankets, clothing and/or basic necessities to 94 Banair Rd. Bangor, Maine 04401, or contact Lara Clark or Sonia Bourgoin at 1-800-479-6676 for more information.